At the core, though, is nutrition. Without good nutrition, you can expect less than optimal health. And according to the Center for Disease Control(CDC), the average American isn't getting enough.To the tune of 90%. Unfortunate, but true. The average meal we consume these days is filled with over-processed and low quality nutrition. Even the 'fresh' fruits and vegetables are not what they were a hundred years ago. They've been engineered for shelf life and looks, not nutrition, They are grown in nutrient depleted soil and have been sprayed with who knows what. Plus, we are now faced with environmental pollutants and even stress that require greater raw materials from the foods we eat to keep up. Over half of Americans take a daily multivitamin pill. But because they are not really nutrition but 'fractions' of nutrition, they simply can't elevate your health to the level you want and need to really help you prevent disease. While they can help, even the best multivitamin pill won't meet the complex needs of your body! Isolated or fractionated nutrients is not how nature works. But adding a teaspoon or two of the SuperNutrient Complex along with your multivitamin, and you can't help but improve your health. Research is proving beyond a doubt that the isolated nutrients in multi-vitamin pills that are missing the hundreds of co-factors and trace nutrients from whole foods are not the way to achieve optimal health and to resist disease. For real nutrition that builds optimal health and provides real prevention, you need the whole foods that nature has perfected over billions of years of evolution.Only nature is truly complete. There are hundreds of individual chemical components that are necessary for your best health. Just look at the evidence. Disease statistics in America off the charts. From cancers, diabetes, heart disease, joint problems, auto-immune diseases and simply more sickness. If a multi were all you needed, you'd think these disease statistics would not be where they are. Of course, it's not only nutrition. There are multiple factors. But it starts there. The SuperNutrient Complex is simply all about nutrition. It doesn't get any better than this! You could eat a bushel of fruits and vegetables and still not get the volume of nutrients you get from the SuperNutrient Complex. Diet plays a huge role in health. And no one eats perfectly, myself included:) But with the SuperNutrient Complex superfoods formula you can now add the nutrition your body and cells need to help keep you strong and healthy. The SuperNutrient Complex is 31 superfoods and support nutrients in a proprietary alkalizing formula. It is packed with hundreds of health promoting and anti-aging antioxidants, vitamins, minerals, enzymes, fiber, nutritional co-factors and trace nutrients. You won't find a more complete formula! It is guaranteed to improve your health inside and out. And compared to other products, it tastes great! One look at the ingredient list tells all. It is a virtual 'who's who' of superfoods. They are nature's finest concentrated foods all in one place for your health! For your best health and to keep you strong, you need the combination of the nutrients found only in nutrient rich plants and fruits. 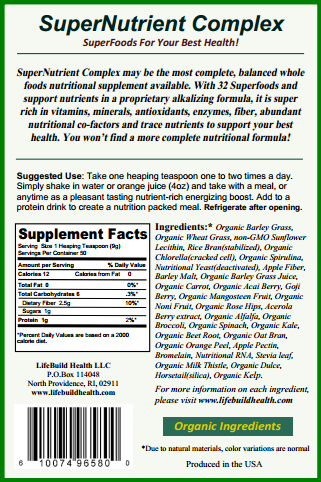 Ingredients: A proprietary blend of Organic Barley Grass, Organic Wheat Grass, Lecithin, Stabilized Rice Bran, SuperFruits Blend( Acai, Goji, Mangosteen, Noni), Organic Spirulina, Organic Chlorella (cracked cell), Nutritional Yeast (deactivated), Barley Malt, Apple Fiber, Organic Barley Grass Juice, Organic Carrot, Rose Hips, Acerola Berry Extract, Organic Alfalfa, Organic Orange Peel, Stevia Leaf, Organic Broccoli, Organic Spinach, Organic Beet Root, Organic Blueberry, Organic Oat Bran, Apple Pectin, Bromelain, Nutritional RNA/DNA, Organic Dulce, Horsetail (Silica) and Organic Kelp. Suggested Use: Take one rounded teaspoon one to two times a day. Simply shake in water or orange juice (4oz) and take with a meal, or anytime as a pleasant tasting nutrient-rich energizing boost. Add to a protein drink to create a nutrition packed meal. Refrigerate after opening. Lots of people (marketers, usually) are claiming this or that food is a superfood. While pomegranates, cranberries and broccoli are really good for you, they are not superfoods! 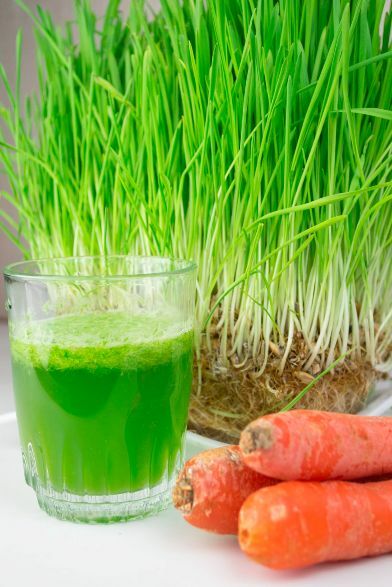 Real superfoods such as barley grass, wheat grass, chlorella and acai berries are those few special foods, plants or fruits that are so vastly superior nutritionally that they are in a category all their own. They've earned it. They are the most potent nutrient rich foods on the planet. By consuming them regularly, you absolutely give yourself the best opportunity to have vibrant health, and to maintain it well into the future. Great taste and super nutrient dense! Awesome value too compared to other greens and wheat grass supplements. No chalky taste or excess grit or foul after taste! Will definitely purchase again! Great addition to smoothies and protein shakes!